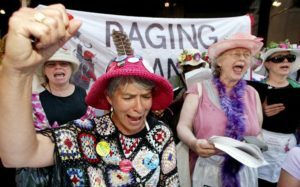 Wouldn’t we all like to be raging grannies, some days? The movement that began in Canada more than 30 years ago has spread to the U.S., the U.K., and beyond. This loosely-knit assortment of social activist specializes in writing songs of protest which they offer up at public events. Their in-your-face dress up gear, as well as their songs, take our old lady stereotypes and fling them them up in the air. Over the years, they have gained enough cred to have been investigated by the California National Guard, and to have been the subject of books, films, and academic articles. But their signature remains their songs; close to 500 of which are available on their website. For example, the Anthem for Women begins, to the tune of the Star Spangled Banner: O-oh say there’s no way, Women get equal pay! Recent hits include Flint Water Atrocity and Come to Me: Song for a Syrian Refugee.